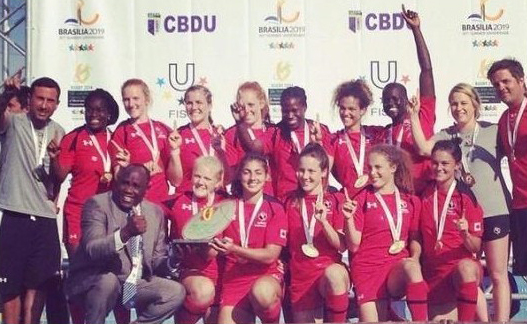 Deanna Foster of the McGill women's rugby team, has won gold with Team Canada at the rugby sevens world championship, sanctioned by the Fédération internationale du sport universitaire, in the Sao Paulo region of Brazil. Jubilant members of Canada’s university 7s rugby team celebrate their world championship win. 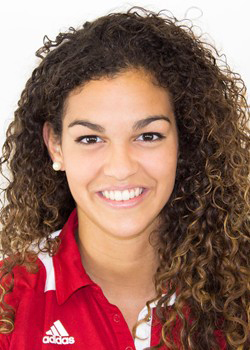 Deanna Foster of the McGill women’s rugby team, won gold with Team Canada on Aug. 10, at the rugby sevens world championship, sanctioned by the Fédération internationale du sport universitaire, in the Sao Paulo region of Brazil. A 20-year-old political science junior and a 5-foot-8 fullback from Caledon, Ont., Foster has also been selected to play for the national under-20 team in a Can-Am tournament in London and Sarnia, Ont., Aug. 20-23. Canada, which won five of their six contests at the FISU tournament, avenged an opening-round 19-12 loss to France with a 26-17 victory over the French squad in the final, Sunday. They also posted preliminary-round victories over Great Britain (38-0) and China (49-5). In the the playoff round, the Canucks upended Belgium 17-10 in the quarter-finals and dumped Great Britain 37-5 In the semifinals. “Very proud of this team’s effort,” said head coach Sandro Fiorino in a Rugby Canada press release. “We had contribution from all 12 players and all of them had a part in our success today. Despite being down, earlier in the gold medal game, the team did not panic and showed strong resilience. Credit to the ladies, they were very unselfish and played for each other.